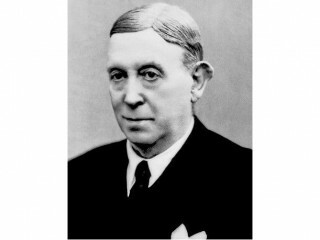 Egas Moniz, was a Portuguese neurologist and the developer of cerebral angiography. He is sometimes regarded as the founder of modern psychosurgery, and developing the surgical procedure termed leucotomy (also known as lobotomy), for which he became the first Portuguese national to receive a Nobel Prize in 1949 (shared with Walter Rudolf Hess). Certain mental illnesses, such as schizophrenia and severe paranoia, involve recurring and detrimental thought patterns, repeated so often that normal psychological processes are overwhelmed. Portuguese neurologist Egas Moniz used surgery to physically sever nerve fibers between the brain's frontal lobes, interrupting the neurological pathway for such thoughts, and, when the process worked, improving the patient's condition. The surgical procedure came to be known as the prefrontal lobotomy, and won Moniz the 1949 Nobel Prize in Physiology or Medicine, an honor shared that year with Swiss physiologist Walter Hess. Moniz was the first Portuguese scientist to win a Nobel Prize. Over subsequent decades, about 100,000 lobotomies were performed worldwide, with the largest proportion performed in the United States. With the development of thorazine in the 1950s, along with ethical, medical, and human rights questions about lobotomies, the technique fell into general disuse by the 1970s. Moniz also developed cerebral arteriography, a method of viewing arteries and veins by using x-rays in combination with injection of a high density agent. Using this procedure, doctors were able to map blood vessels in and around the brain, a breakthrough that has proven to be of more lasting significance than the lobotomy. Though never a part of his legal name, Egas Moniz is the name he always went by. It was given him by his godfather when Moniz was an infant, honoring another Egas Moniz who, according to legend, fought with the Portuguese resistance against the Moors in the 12th century. Something of a bon vivant, the 20th century Moniz wrote several well-received books on popular culture, including his History of Playing Cards, and a biography of a hypnotist/priest. He served more than a decade in the Portuguese Parliament, and was Portugal's Ambassador to Spain during World War I. At the Paris peace conference in 1918, he led the Portuguese delegation, and signed the Treaty of Versailles for his nation. View the full website biography of Egas Moniz.